HENDERSON, Nev. – The Spring Mountain Visitor Gateway, already open to the public, encompasses 90 acres of Forest Service land and serves as both a gateway to and an orientation for the Spring Mountains National Recreation Area (SMNRA), while also functioning as a destination for families in the Las Vegas community. The project opened without fanfare, yet represents the culmination of five years of work coordinated by Las Vegas-based architecture firm, LGA. Built on a now-defunct golf course that had badly damaged the site, the Spring Mountain Visitor Gateway acts as an urban interface to connect city dwellers with the unique ecosystem of Mt. Charleston and SMNRA. The Visitor Gateway begins with transition zones leading to the forest, starting with a rest stop-like area near the highway that provides travelers with a place for a quick picnic or break. 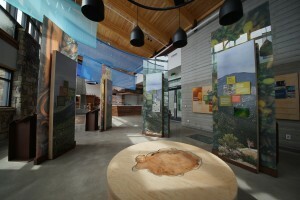 Next, visitors can experience the interpretive gallery in the Visitor Center. The third level includes the Gateway, an education facility and open plaza that connects to trails leading into the Valley. The Visitor Center and education building are both designed to deliver an inside-outside experience, creating a natural, holistic feel that honors the landscape. The Gateway also honors the Paiute people, who hold Mt. Charleston as their ancestral birthplace. The Seven Stones Plaza was designed to represent the seven different nations, and the creation story is told through subtly etched images that surround the large center stone. Tribal families are invited to harvest pine nuts to maintain their seasonal tradition. “Prior to this project, there had never been an orientation to Mt. Charleston or SMNRA,” said Deborah Bergin, LGA’s project manager for the Spring Mountain Visitor Gateway. This led to overuse of the areas that were more easily accessible, such as Cathedral Rock, without an understanding of the impact on the surrounding ecosystem. 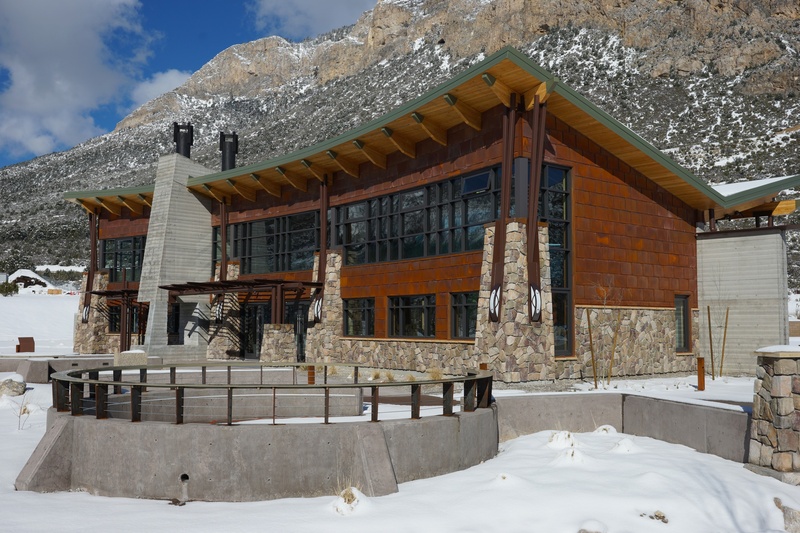 “By repurposing an already heavily disrupted area for the Spring Mountain Visitor Gateway, we’ll actually alleviate overuse in other areas,” explained Galati, whose architectural firm has built a reputation as pioneers of eco-smart designs and green building methods. In fact, the firm is best known for designing the Platinum LEED-Certified Desert Living Center & Gardens at the Springs Preserve as well as for their work on the LEED-certified Springs Preserve master plan. In importance to the community, Galati likened the Spring Mountain Visitor Gateway to the Springs Preserve. Ultimately, the concept of the Spring Mountain Visitor Center is based around community.